White PVC posts are built into the mesh every 13.5 ft. The result, when energized properly, is a nearly impenetrable mesh to sheep, goats, coyotes and dogs. How does it compare to ElectroNet? 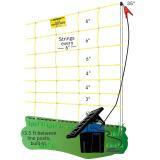 Has string verticals every 6" instead of plastic struts every 12". 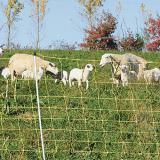 String is more prone to sagging but the closer vertical spacing is better for controlling foxes, lambs and goat kids. Has 10 times more electrical resistance (380 Ω/1000 ft) so it's less suited for fences more than 1000 ft long. Not as easy to handle during removal and installation. Yellow color not as visible in light/dark situations as white/black. Used to keep sheep, goats, guard dogs in while keeping out stray dogs and coyotes. Also used to keep bear away from bee hives. Can be used for cattle. 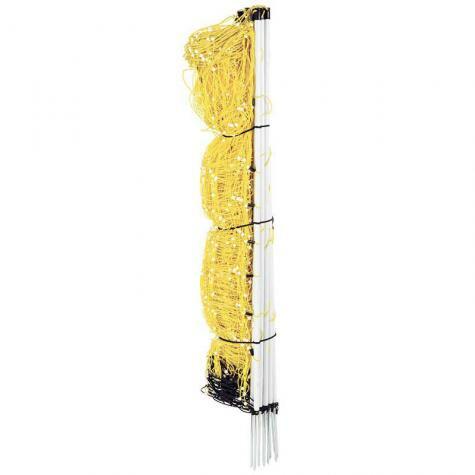 Vertical Strands Plastic strings spaced every 6"
Horizontal Spacings 6", 3", 4", 4", 6", 6", 6"
#208430 - $0.63 per ft (164' roll with single spike posts). This is a pain barrier, not a physical barrier. If animals are scared or starved it will not keep them in. It is best to have animals trained to electric fencing before you turn them out in the net only. The first time you put the animals in the net, you should be available to watch them for a while. That way if one were to get into the fence and get caught, you can turn the power off and get them loose. Note: We’re aware that the lower price of this net will encourage folks to choose this version. Think carefully before you do so. Customers who are unhappy with netting are often those who’ve chosen its farmstore/catalog equivalents. So why do we offer it? Because it is similar to nets from other sources—and comparisons make decisions easier. If unsure, give us a call at 800-282-6631 and ask to speak to consultant. They will help you make the optimal netting choice for your fencing needs. Use only with a low or wide impedance intermittent pulse energizer. Warning! Do NOT use continuous output energizers with electric netting due to risk of fire. (Fi-Shock™ brand energizers which are sold as low impedance, continuous current output should NOT be used with electric netting.) All energizers sold on Premier's website use an intermittent pulse and are suitable for use with electric netting. 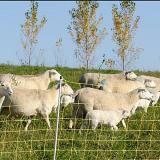 Dry conditions and wintertime usage may reduce the effectiveness of electric fencing. If the voltage drops below 3000v on the net, you need to turn off the energizer and unhook the net from the energizer. Test just the energizer by itself. If the voltage is 5000v or higher on the energizer the problem is in the net. The most common problem is that the lowest 'hot' strand has been caught around one of the metal spikes on the posts and is shorting it out. The net must be at least 2" away from anything metal (metal posts, existing fences, spikes on support posts). Though it is the “economical” version of ElectroNet, it does the job it’s built for. The main difference is looks. It is harder to keep the net upright because Electric Sheep Net's vertical strings do not hold the horizontal strands as well as the plastic stays of ElectroNet—so sagging may occur in curves, corners and elevational changes. Easy, Quick setup, works perfectly. Bought this for my pastured pigs - great price, super easy to use and works great for the pigs even though its rated for sheep and goats. Appreciated the free shipping. Great product, easy to install. I use it for my goats and it works extremely well. I am so glad to see this economical option. So far I really like the yellow color better. it is still visible but blends against the pasture in a pleasing way. It seems easier and faster to set up to me. I will still use my pricier white net in difficult terrain and where I need sturdier fencing, but for flat areas and cross fencing, this stuff is great and affordable too.